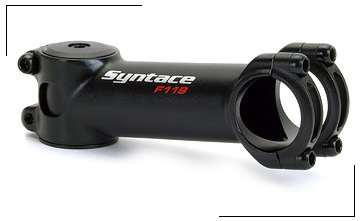 PRECISION TANDEMS - SYNTACE 1 1/4" F119 STEM - ALSO FITS 1 1/8" WITH SHIM! The new Syntace stem system applied to the 31.8 mm handlebar clamping dimension. Light at 31.8 mm and for the VR-3 test machine still a tough nut to crack - the Syntace Force 119 (int.pat.pend.). is being used for the handlebar clamping diameter then the rest of the stem should be made as stiff and strong. A thicker stem tube is used, this 31.8mm diameter is kept throughout the stem to the clamp area. We then leave the steerer tube clamp diameter 31.8 and use a alu bushing to bring it down to 28.6.
of new, high-strength and forgeable aluminium alloy and real 3D forging. The result: The lightest stem, which is simultaneously bombproof and as stiff as other stems that weight 160g. Due to the fact that we use a bushing between the stem and the steerer tube we are able to produce a better clamp area for carbon steerer tubes. Since the bushing is fully en-closed and can apply constant pressure the clamp is more secure. The F99/26.0’s bar clamp surrounds the bar for 200 degrees, for greater strength and less flex. RC 2002.3, the world‘s toughest test standard for handlebars and stems.